Had our annual outing to the Deseronto Sidewalk Sale yesterday, where Child#2 and I sold a fair quantity of tomato and pepper plants. For once, the weather was decent (the last two occasions were wet and cold, making for few customers) and our stall outside the library did well. I'm glad I sowed the seeds earlier than usual - the spring has been so cold that they needed the extra two weeks to reach a reasonable size. The stall next to ours was the Friends of the Library's one. In amongst the usual yard sale fare was an electric pasta machine. I don't usually buy anything from yard sales - figuring that I've got enough objects in my life and don't need to add to the number by buying other people's cast-offs. 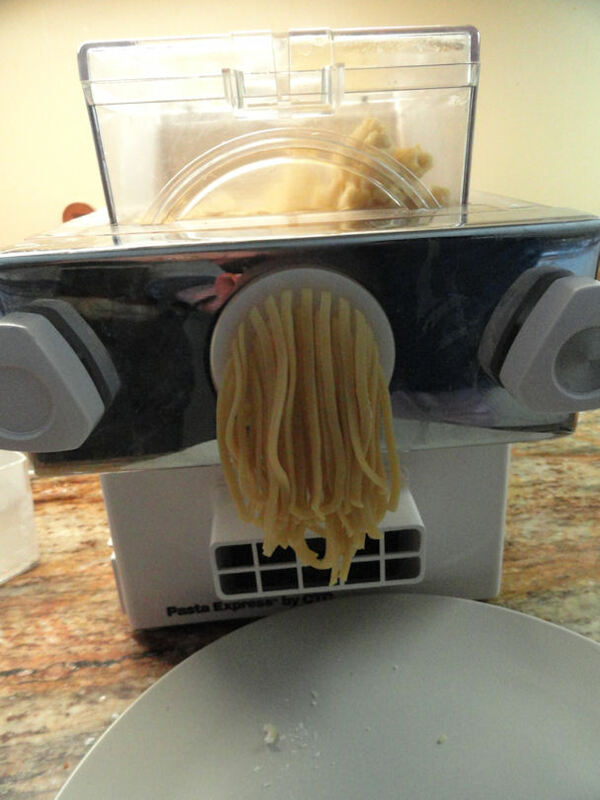 But I've always hankered after a pasta maker and, in the end, couldn't resist the purchase. I met the original owners later in the day, who admitted that they'd only used the machine once. So I'm hoping there's quite a bit of life left in it, even though it must be around 20 years old! Making pasta is something I've been interested in doing for a while, but the traditional manual method of rolling pasta by hand always seemed too hard. I could buy a pasta attachment for my food mixer, but $180 seems a lot to shell* out for such a thing. I didn't even know that you could buy a dedicated pasta machine that would do the mixing and extrusion processes. The original owners had lost the instructions, but that wonderful Internet thing provided both the manual and the original instructional video, so I was able to swot up on how it worked. The video was surprisingly entertaining, for its genre. 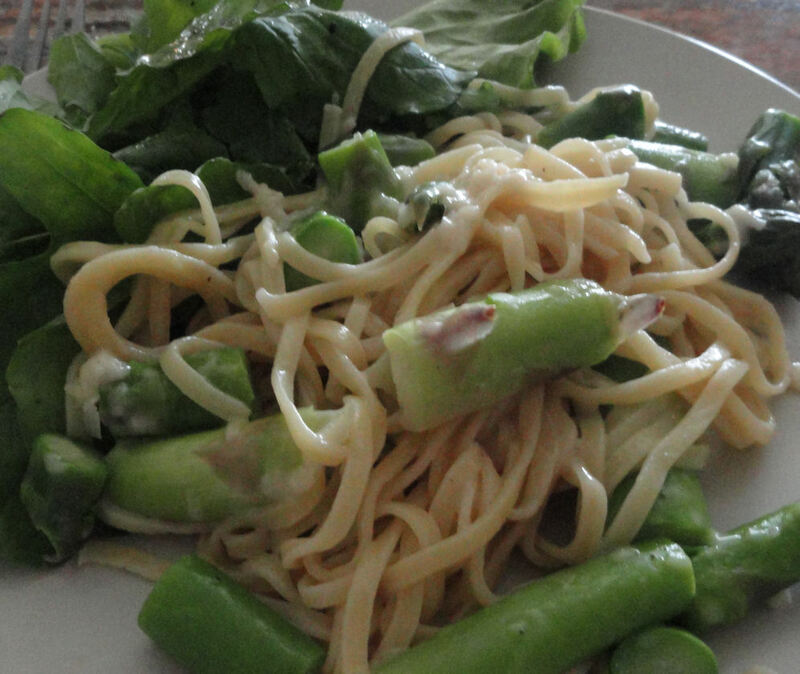 And here's the finished pasta. Which I think looks pretty fantastic for a first attempt. I am definitely going to be using this machine more than once! The first asparagus spears were ready for picking, so I served the linguine (well, half of it - there's a bit too much for one meal there) with asparagus and Parmesan for lunch. Making pasta the . . . putting effort in way! Extra effort. Extra washing up. 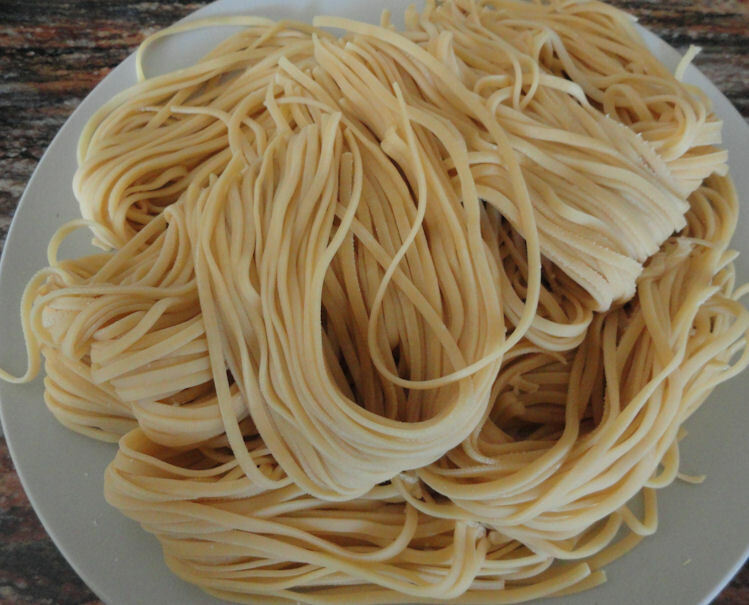 Making pasta the lazy way is tipping it dried out of a packet. Well, it seems lazy compared to manually mixing it and rolling it out! Tastes a lot better than the dried stuff, according to the rest of the family. I did worry that the machine would be hard to clean - but it was very straightforward, which makes it more likely that I'll use it! Doesn't turn out to be any cheaper than buying it dried and ready-made, though (or even fresh! ).